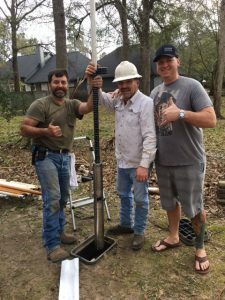 Archive by category "Drilling A Well"
77 Water Well provides water well drilling and water well repair in the Houston, Spring, Tomball, Magnolia, Cypress, Katy, Brookshire, Conroe, Plantersville, Willis, Montgomery, The Woodlands, and surrounding areas. We are pre-screened by Home Advisor and have excellent ratings from all of our customers. Look around on the internet and you will not find a better water well drilling and installation company around. By being open twenty-four hours a day, every day, we are here to help with all of your water well repair issues. No matter how small or how large of a problem that you are having, 77 Water Well can help! came out after hours,..they got us back in water, in no time. Very nice. Really appreciated seeing them drive up. To learn more about the services that we offer, contact 77 Water Well at 281-456-4556 or email us at service@77waterwell.com to schedule a consultation. Water Well Freezing Temperatures – remember to wrap your exposed pipes. To prevent freezing you will need to insulate your pipes. You can do this by either wrapping your pipes with a good quality insulating material or heat tape. Another option is to keep the temperature of your pump house above 38°F. You can also add a heat lamp for additional warmth but be careful you don’t start a fire. Remember that there is always a small amount of water in the pipe connection to the pressure switch, and it is extremely vulnerable to freezing. All insulating materials can be picked up at your local hardware store and is very affordable. Old blankets will also work to prevent pipes from freezing. If the temperature only drops a little bit, you might get away with some heavy duty foam insulation on the pipes.By taking the time to prevent your pipes from freezing, it will save you the headache and expense later on. Another preventative measure is to also check to make sure that your pipes aren’t leaking. This will prevent mildew build-up and additional freezing risk. If your pipes freeze, you can always use a hair dryer to thaw them out. Inspect your well house before winter arrives and use preventative steps to ensure your pipes won’t freeze. Don’t forget that temperatures can drop to freezing, even in Texas. We at 77 Water Well Inc., James & Shelley Galloway, are ready willing and able to provide the best service on your water well. You are our #1 Priority! Give us a call at 281-456-4556! The process of designing and constructing a water well begins when you make arrangements with a licensed driller or with a professional consultant who designs the well and oversees the work of the licensed driller. The driller finds a suitable location to meet the specified purpose of the well and a preliminary design is established. Once the drilling rig is set up, the drilling process itself may last from a few hours (for a shallow, small-diameter well) to several weeks (for a deep, large-diameter well). Sometimes, particularly for large production wells and where water quality is particularly important, the driller will drill a small-diameter pilot hole before drilling the well bore. From information obtained from the pilot hole, a driller or consultant can determine aquifer formations and groundwater quality at various depths and then optimize the final well design for the specific hydrogeological conditions at the site. Appropriate materials (screen, casing, gravel) can then be ordered in a timely fashion prior to the final drilling. Once the well bore is drilled, the driller installs well casing and well screens and fills the annulus around the casing with a gravel (filter) pack and the appropriate cement and bentonite seal to prevent water from leaking between uncontaminated and contaminated aquifers or from the land surface into the well (bentonite is a special type of clay used to seal against water leaks). Then the driller develops the well, implements an aquifer test, completes the sanitary seal of the well head, and installs a pump and power source. Proper design, construction, development, and completion of the well will result in a long life for the well and efficient well operation. Please contact 77 Water Well at 281-456-4556 or email us at service@77waterwell.com for more information about drilling a well or to schedule a consultation.